An overview of our activities also gives a brief introduction to virtual source imaging. This technology is based on binaural technology which is the art of "fooling" the human localisation mechanism. We have developed a number of sophisticated digital filter design techniques that enable us to control the sound field at several points in space simultaneously by applying the principle of cross-talk cancellation. 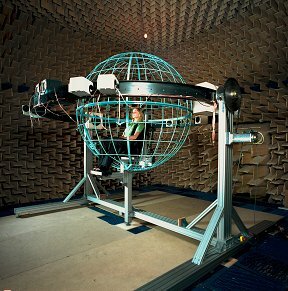 Research into numerical modelling techniques is used to calculate the reproduced sound field, and is reconciled with research into multi-channel systems. We highlight a very specific virtual imaging system, the stereo dipole, which uses only two very closely spaced loudspeakers. Optimal Source Distribution (OSD), provides novel and effective loudspeaker design and signal processing principle which enables lossless crosstalk cancellation process. Recently we have started investigating visually adaptive systems which can update the filters in real time. If you want more information, you can consult a list of some of our publications, or you can write to us with your questions and comments.